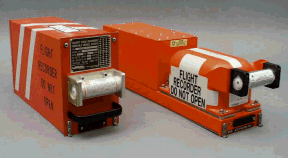 An example of a flight data recorder; the underwater locator beacon is the small cylinder on the far right. (Translation of warning message in French: FLIGHT RECORDER DO NOT OPEN) The warning appears in English on the other side. A flight recorder, commonly known as a black box, although it is now orange-coloured, is an electronic recording device placed in an aircraft for the purpose of facilitating the investigation of aviation accidents and incidents. The flight data recorder (FDR) is a device that preserves the recent history of the flight through the recording of dozens of parameters collected several times per second. The cockpit voice recorder (CVR) preserves the recent history of the sounds in the cockpit including the conversation of the pilots. The two recorders give an accurate testimony, narrating the aircraft's flight history, to assist in any later investigation. One of the earliest and proven attempts was made by François Hussenot and Paul Beaudouin in 1939 at the Marignane flight test center, France, with their "type HB" flight recorder; they were essentially photograph-based flight recorders, because the record was made on a scrolling eight meters long by 88 milimeters wide photographic film. The latent image was made by a thin ray of light deviated by a mirror tilted according to the magnitude of the data to record (altitude, speed, etc.). A pre-production run of 25 "HB" recorders was ordered in 1941 and HB recorders remained in use in French test centers well into the seventies. In 1947, Hussenot founded the Société Française des Instruments de Mesure with Beaudouin and another associate, so as to market his invention, which was also known as the "hussenograph". This company went on to become a major supplier of data recorders, used not only aboard aircraft but also trains and other vehicles. SFIM is today part of the Safran group and is still present on the flight recorder market. The advantage of the film technology was that it could be easily developed afterwards and provides a durable, visual feedback of the flight parameters without needing any playback device. On the other hand, unlike magnetic bands or later flash memory-based technology, a photographic film cannot be erased and recycled, and so it must be changed periodically. As such, this technology was reserved for one-shot uses, mostly during planned test flights; and it was not mounted aboard civilian aircraft during routine commercial flights. Also, the cockpit conversation was not recorded. Another form of flight data recorder was developed in the UK during World War II. Len Harrison and Vic Husband developed a unit that could withstand a crash and fire to keep the flight data intact. This unit used copper foil as the recording medium with various styli indicating various instruments / aircraft controls which indented the copper foil. The copper foil was periodically advanced at set periods of time therefore giving a history of the instruments / control settings of the aircraft. This unit was developed at Farnborough for the Ministry of Aircraft Production. At the war's end the Ministry got Harrison and Husband to sign over their invention to them and the Ministry patented it under British patent 19330/45. This unit was the forerunner of today's black boxes being able to withstand conditions that aircrew could not. The first modern flight recorder, called "Mata Hari", was created in 1942 by Finnish aviation engineer Veijo Hietala. This black high-tech mechanical box was able to record all important aviation details during test flights of World War II fighter aircraft that the Finnish army repaired or built in their main aviation factory in Tampere, Finland. The "Mata Hari" black box is displayed in the Vapriikki Museum in Tampere, Finland. In 1953, Australian engineer David Warren conceived a device that would record not only the instruments reading, but also the cockpit voices, when working with the Australian Research Laboratories. He built the first prototype in 1958. Warren, when working with the Defence Science and Technology Organisations' Aeronautical Research Laboratory (Melbourne, Australia), published a 1954 report entitled "A Device for Assisting Investigation into Aircraft Accidents" and built a prototype FDR called "The ARL Flight Memory Unit" in 1957. The first coupled FDR / CVR prototype designed with civilian aircraft in mind, for explicit post-crash examination purposes, was produced in 1958. However, aviation authorities from around the world were largely uninterested. This changed in 1958 when Sir Robert Hardingham, the Secretary of the British Air Registration Board, visited the ARL and was introduced to Warren. The Aeronautical Research Laboratory allocated Warren an engineering team to develop the prototype to airborne stage. The team, consisting of electronics engineers Lane Sear, Wally Boswell and Ken Fraser developed a working design incorporating a fire and shockproof case, a reliable system for encoding and recording aircraft instrument readings and voice on one wire, and a ground-based decoding device. The ARL system became the "Red Egg", made by the British firm of S. Davall & Sons, Ltd., of Greenford, Middlesex. The "Red Egg" got its name from its shape and bright red color. In 1965 the units were redesigned and moved to the rear of airplanes to improve the probability of successful data retrieval after a crash. The "Flight Recorder" was invented and patented in the United States by Professor James J. "Crash" Ryan, a professor of mechanical engineering at the University of Minnesota from 1931 to 1963. Ryan's "Flight Recorder" patent was filed in August 1953 and approved on November 8, 1960; see US Patent 2,959,459. A second patent by Ryan for a "Coding Apparatus For Flight Recorders and the Like" is US Patent 3,075,192 dated January 22, 1963. An early prototype of the Ryan Flight Data Recorder is described in the January 2013 Aviation History Magazine article "Father of the Black Box" by Scott M. Fisher. Ryan, also the inventor of the retractable safety seat belt now required in automobiles, began working on the idea of a flight recorder in 1946, and invented the device in response to the 1948 request from the Civil Aeronautics Board for development of a flight recorder as a means of accumulating data that could be used to get information useful in arriving at operating procedures designed to reduce air mishaps. The original device was known as the "General Mills Flight Recorder". The benefits of the flight recorder and the coding apparatus for flight recorders were outlined by Ryan in his study entitled "Economies in Airline Operation with Flight Recorders" which was entered into the Congressional Record in 1956. Ryan's Flight Recorder maintained a continuing recording of aircraft flight data such as engine exhaust, temperature, fuel flow, aircraft velocity, altitude, control surfaces positions, and rate of descent. The origin of the term "black box" is uncertain. In a systems engineering context (since the 1960s when the term was spreading), the meaning is that the aircraft is modeled as a black box, and its behaviour can be understood from its recorded inputs, such as pilot instructions, and outputs, such as flight level data. The term "black box" is almost never used within the flight safety industry or aviation, which prefers the term "flight recorder". The recorders are not permitted to be black in color, and must be bright orange, as they are intended to be spotted and recovered after incidents. The term black box has been popularised by the media in general. One explanation for popularization of the term "black box" comes from the early film-based design of flight data recorders, which required the inside of the recorder to be perfectly dark to prevent light leaks from corrupting the record, as in a photographer's darkroom. Another explanation of the "black box" term popularization came from a meeting about Warren's "Red Egg", when afterwards a journalist told Warren: "This is a wonderful black box." The unit itself was based on an EMI Minifon wire recorder (originally a 1950s espionage gadget from the West-German manufacturer Protona Monske) fitted into a perspex box firmly screwed together. Another possible origin of the term is World War II RAF jargon. Prior to the end of the war in 1945, new electronic innovations, such as Oboe, GEE and H2S, were added to bombers on a regular basis. The prototypes were roughly covered in hand-made metal boxes, painted black to prevent reflections. After a time any piece of "new" electronics was referred to as the "box-of-tricks" (as illusionist box) or the "black box". The first recorded use of the term "black box" in reference to flight data recorders and cockpit voice recorders was by Mr E. Newton of the AAIB at a meeting of the Aeronautical Research Council in August 1958. A flight data recorder (FDR) (also ADR, for accident data recorder) is an electronic device employed to record instructions sent to any electronic systems on an aircraft. 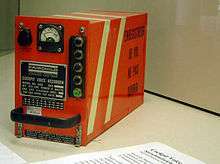 Another kind of flight recorder is the cockpit voice recorder (CVR), which records conversation in the cockpit, radio communications between the cockpit crew and others (including communication with air traffic control personnel), as well as ambient sounds. Modern day FDRs receive inputs via specific data frames from the Flight Data Acquisition Units (FDAU). They record significant flight parameters, including the control and actuator positions, engine information and time of day. There are 88 parameters required as a minimum under current US federal regulations (only 29 were required until 2002), but some systems monitor many more variables. Generally each parameter is recorded a few times per second, though some units store "bursts" of data at a much higher frequency if the data begin to change quickly. Most FDRs record approximately 17–25 hours of data in a continuous loop. It is required by regulations that an FDR verification check (readout) is performed annually in order to verify that all mandatory parameters are recorded. Where an aircraft is required to carry a CVR and uses digital communications the CVR is required to record such communications with air traffic control unless this is recorded elsewhere. As of 2008 it is an FAA requirement that the recording duration is a minimum of two hours. A standard CVR is capable of recording 4 channels of audio data for a period of 2 hours. The original requirement was for a CVR to record for 30 minutes, but this has been found to be insufficient in many cases, significant parts of the audio data needed for a subsequent investigation having occurred more than 30 minutes before the end of the recording. With the advent of digital recorders, the FDR and CVR can be manufactured in one fireproof, shock proof, and waterproof container as a combined digital Cockpit Voice and Data Recorder (CVDR). Currently a CVDR is manufactured by L-3 Communications as well as other manufacturers. Cockpit voice recorder module of PR-GTD, a Gol Transportes Aéreos Boeing 737-8EH SFP, found in the Amazon in Mato Grosso, Brazil. In the investigation of the 1960 crash of Trans Australia Airlines Flight 538 at Mackay (Queensland), the inquiry judge strongly recommended that flight recorders be installed in all airliners. Australia became the first country in the world to make cockpit-voice recording compulsory. The United States' first CVR rules were passed in 1964, requiring all turbine and piston aircraft with four or more engines to have CVRs by March 1, 1967. As of 2008 it is an FAA requirement that the CVR recording duration is a minimum of two hours, following the NTSB recommendation that it should be increased from its previously-mandated 30-minute duration. As of 2014, the United States requires flight data recorders and cockpit voice recorders on aircraft that have 20 or more passenger seats, or those that have six or more passenger seats, are turbo-charged, and require two pilots. The disappearance of Malaysia Airlines Flight 370 demonstrated the limits of the contemporary flight recorder technology, as physical possession of the flight recorder device is necessary to help investigate the cause of an aircraft incident. Considering the advances of modern communication technology commentators called for flight recorders to be supplemented or replaced by a system for "live streaming" data from the aircraft to the ground. Furthermore commentators called for the battery life of the underwater locator beacons to be extended from 30 to 90 days, the range of the locator to be increased and additionally for the outfitting of civil aircraft with deployable flight recorders, which are commonly used in military aircraft. Previous to MH370 the extension of the battery life has been suggested as "rapidly as possible" by investigators of the Air France Flight 447 crash; the AF447 crash happened in 2009 but the flight recorders were not recovered until 2011. ↑ "Dave Warren - Inventor of the black box flight recorder". Defence Science and Technology Organisation. Archived from the original on July 6, 2011. ↑ "Australian Research Laboratories". Apc-online.com. February 9, 2000. Retrieved March 11, 2014. ↑ "A Brief History of Black Boxes". Time Magazine. No. July 20. 2009. p. 22. Retrieved February 1, 2012. ↑ "Aviation History - Books, Facts, News, Photos / Art Gallery". aviationhistory.org. 1 2 "Cockpit Sound Recorder". Google Patents. Google Inc. Retrieved 31 December 2013. ↑ "The Flight Data Recorder". Aviation Digest, May 11, 2015, page 58. ↑ "France to resume 'black box' hunt". BBC News. December 13, 2009. Retrieved April 30, 2010. ↑ "Beyond the Black Box". IEEE Spectrum. July 30, 2010. Retrieved April 28, 2014. ↑ "radar - 1946 - 0844 - Flight Archive". flightglobal.com. ↑ Archived January 24, 2014, at the Wayback Machine. ↑ "Flight Data Recorder Systems" (PDF). Federal Aviation Administration. April 10, 2007. Section 3 Point B. Retrieved April 8, 2010. ↑ "Flight Data Recorder OSA". ↑ "SSFDR Solid State Flight Data Recorder, ARINC 747 - TSO C 124 - ED 55" (PDF). Archived from the original (PDF) on November 8, 2012. ↑ "Cockpit Voice Recorder Equipment" (PDF). Federal Aviation Administration. June 1, 2006. Retrieved April 21, 2007. 1 2 "Federal Aviation Regulation Sec. 121.359(h)(i)(2), amendment 338 and greater - Cockpit voice recorders". Risingup.com. Retrieved February 7, 2013. ↑ "Federal Aviation Regulation Sec. 23.1457 - Cockpit voice recorders". Risingup.com. Retrieved February 7, 2013. ↑ "L-3 Aviation Recorders". l-3ar.com. ↑ "History of Flight Recorders". L3 Flight Recorders. Archived from the original on December 11, 2013. ↑ Luftfahrt. "European Organisation for Civil Aviation Equipment". Eurocae.net. Retrieved March 11, 2014. ↑ "TSO-C124a FAA Regs". Airweb.faa.gov. May 23, 2006. Retrieved March 11, 2014. ↑ "Black box flight recorders". ATSB. April 1, 2014. ↑ Archived August 11, 2007, at the Wayback Machine. ↑ "Dave Warren - Inventor of the black box flight recorder". Defence Science and Technology Organisation. March 29, 2005. Archived from the original on May 22, 2010. Retrieved April 20, 2010. ↑ Campbell, Neil. "The Evolution of Flight Data Analysis" (PDF). Proc. Australian Society of Air Safety Investigators conference, 2007. ↑ "2011 Most Wanted List Page. Recorders." NTSB Archived August 4, 2014, at the Wayback Machine. ↑ > U.S. Code of Federal Regulations (April 25, 2010). "14 CFR 91.609". Legal Information Institte. Cornell Law School. Retrieved June 17, 2016. ↑ > "History of the NTSB". NTSB Official Site. Retrieved June 17, 2016. ↑ "ARINC Store, 700 series". 1 2 "Aviation Today". aviationtoday.com. ↑ "Safe Aviation and Flight Enhancement Act of 2005 (2005; 109th Congress H.R. 3336) - GovTrack.us". GovTrack.us. ↑ "Text of the Safe Aviation and Flight Enhancement Act-((SAFE) Act of 2003)". Retrieved August 2, 2015 – via govtrack.us. ↑ "Bill Text - 108th Congress (2003-2004) - THOMAS (Library of Congress)". Thomas.loc.gov. Retrieved March 11, 2014. ↑ "Bill Text - 109th Congress (2005-2006) - THOMAS (Library of Congress)". Thomas.loc.gov. Retrieved March 11, 2014. ↑ "Bill Text - 110th Congress (2007-2008) - THOMAS (Library of Congress)". Thomas.loc.gov. Retrieved March 11, 2014. 1 2 "NTSB — Most Wanted". Ntsb.gov. Archived from the original on November 3, 2013. Retrieved March 11, 2014. ↑ Jansen, Bart. "Lawmaker urges 'black boxes' that eject from planes". USA Today. ↑ "Malaysia Airlines flight MH370 makes it clear: we need to rethink black boxes | Stephen Trimble | Comment is free". theguardian.com. Retrieved March 31, 2014. ↑ "Malaysia Airlines MH370: Why airlines don't live-stream black box data". Technology & Science. CBC News. August 4, 2005. Retrieved March 31, 2014. ↑ Yu, Yijun. "If we’d used the cloud, we might know where MH370 is now", The Conversation (website), London, March 18, 2014. Retrieved on August 21, 2014. ↑ "MH370: Expert demands better black box technology". The Sydney Morning Herald. ↑ "AirAsia QZ8501: More bad weather hits AirAsia search". BBC News. January 1, 2015. 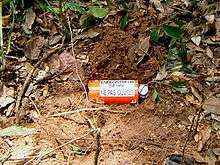 ↑ "AirAsia crash makes case for ejectable black boxes". Reuters. Retrieved January 14, 2015. ↑ "Collective: Unconscious". Charlievictorromeo.com. July 3, 2012. Retrieved February 7, 2013. US 3075192 James J. Ryan: "Coding Apparatus for Flight Recorders and the Like"